In collaboration with landscape architecture firm DTAH, our friends at Perkins+Will redesigned the building which houses the Bank of Canada in Ottawa. The structure, originally designed by the Canadian architect Arthur Erickson in the 1930’s, later updated by the same in the 1970’s, required a number of important upgrades to meet today’s building standards and the perceived needs of contemporary workplaces; the stated goal of the creative team was to re-energize the offices, drawing inspiration from Erickson, many of whose works carefully integrated architecture and landscape design. 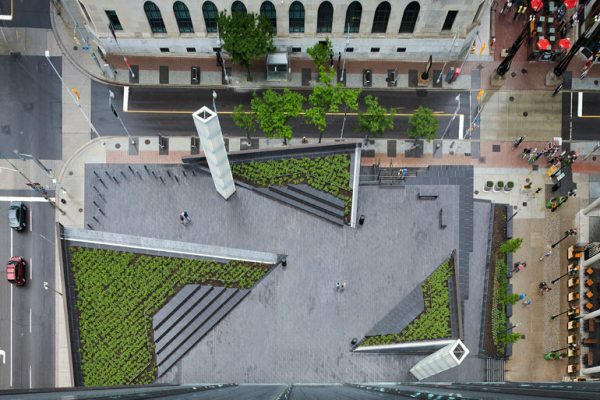 DTAH and Perkins+Will introduced sculptural structures in crystalline glass to the building’s public plaza, which also serve as seating, and in the same space, took up the English slate which originally abounded there and replaced it with a locally sourced granite more resilient to cold weather. For the interiors, they transformed what was originally a program clearly delineated into private work areas into a more open work environment conducive to collaboration.